It was a long trip in the (car, boat, helicopter) to (exotic location). We were really excited to be in (exotic location). We got one last good night's rest then (skinned, snowshoed, dogsledded) as far as we could before setting up camp. We were nervous about (avalanches, crevasses, overhanging seracs, rock face), but tried to sleep anyway. We got up before dawn and skinned up as far as we could go. Then we had to face the (avalanches, crevasses, overhanging seracs, rock face), but we made it. It was beautiful from the top. We could see all the way to (other exotic location). Then we shredded the pow on the way down. The end. I was bored. The genre was dull. Now I admit that not every trip goes according to plan. If something went wrong then you've got an interesting story, but that's not good writing, that's a lucky break for your narrative (unlucky for the folks involved). I've written my share of “something went wrong” stories. They're fun to write. They get a lot of hits. They can be the most useful to read too. But, all happy trip reports are alike; each unhappy trip report is unhappy in its own way. What can I say about the Iron Knee 25k? The race was beautifully managed by the Mountain Madness folks. There weren't too many people. The aid stations were well stocked. 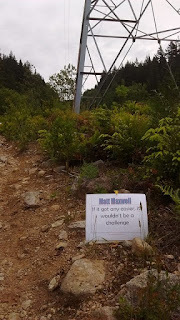 There was even a long climb called “The Powerline” that, yes, ran along a powerline right-of-way. There were rocks and roots. There were smooth, fast sections. There were views of mountains and water. I had a good run, but I was out of shape. I was more sore afterwards than I wanted to be. It was too short. It was a happy race. But maybe that's not all there is. This was my first glimpse into a community of runners here in Vancouver. It was my first time seeing people who I felt like I knew. Who I connected with. I struck up conversations with folks at the start line. They seemed to understood how hard it is to get out and do something in this fenced in city. They understood that it isn't the outdoor paradise that is promised. That long trip to the start wasn't by boat or car or dogsled, it was two hours by foot and train and bus and it started at 5:30 in the morning. 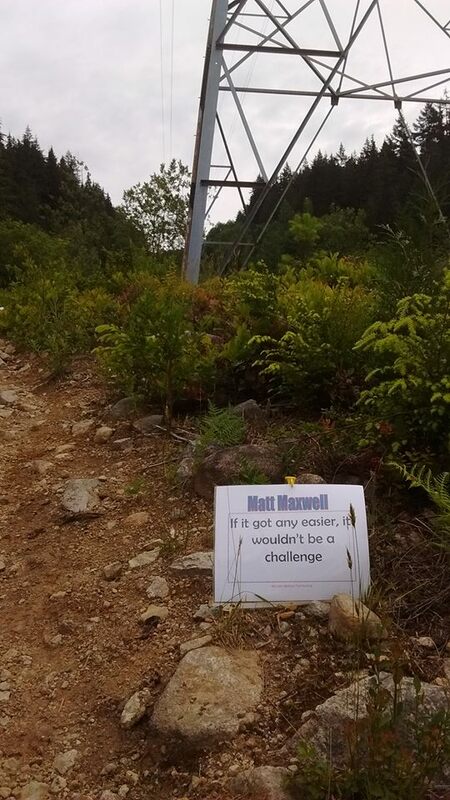 That long powerline climb featured signs with each runners name and a message for each of us. Mine read, “If it got any easier, it wouldn't be a challenge.” Did I get any names; did I make any friends? No. But for a little while I felt like I was home.